The town of Akwidaa, along the western coast of Ghana, must be home to the friendliest children in the entire world. Perhaps trained by the wandering tourists that come through this tiny village occasionally baring candy and certainly offering photographs, the kids race out of their houses with their friends to see the white men and women walking their sandy streets. They extend their hands for high-fives and test the words of English they’ve learned at school. Around a corner a group of young boys tap away at tin cans and bottles with finely shaped sticks. The sound is actually really impressive, as if it is coming from a set of masterfully crafted musical instruments. As soon as they see me stepping past, they race out and demand I photograph them. I do one better and film them as well. Apparently, I’ve opened a can of worms. If children in Africa enjoy seeing their photo on the back of cameras, they border on hysterical when they see videos. 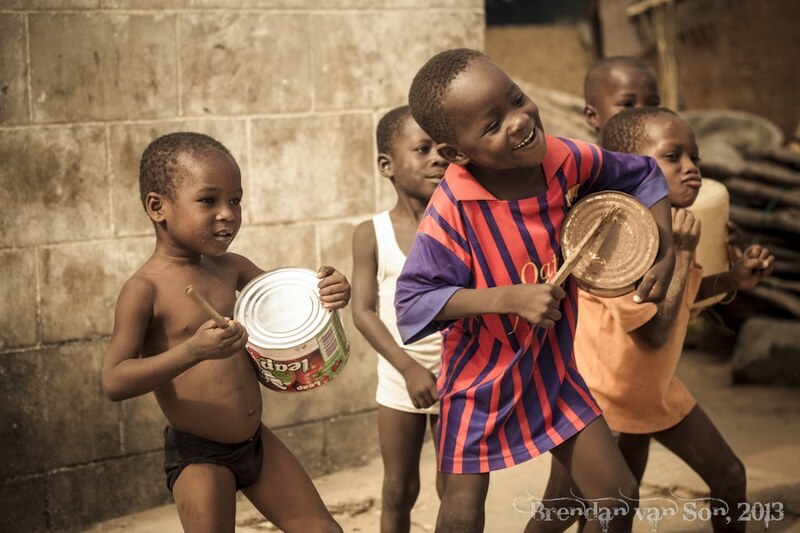 Of all the music I’ve heard in Ghana, this impromptu concert by Ghana’s youngest boy band was easily my favourite. As is so often the case with photography, I got a little bit lucky in this situation. There was another tourist in my group and the kids focused their attention on her camera. And while I do like that portraits of people are looking at me, I also really love when they seem to be as natural as possible. Technically, there isn’t really any luck to this photo. I had purposely brought my 50mm lens to the village for 2 reasons: 1) that lens is the smallest and least threatening and 2) it is a great focal length for portraits and images like this. I focused my lens on the leader of the group because he was the most expressive, but didn’t want to blur out the boy to the left since he was also entertaining in his expression. Thus, rather than shooting this really wide open like f/1.8 I shot it at f/3.2 to ensure that the front of the image was all in focus. What I really love about this image is that the more you look at it the more you see. There are so many dimensions to the shot, and that’s something that can only be created by a really great scene. That is a really sweet portrait of the kids – lost in their fun, thoroughly enjoying themselves and not worried about you and your camera. We should all have moments like that. They were so awesome haha. Hillarious. What’s great about this one is you don’t need to hear the music to want to do a little head bob sway right along with them, the music is in the portrait. Love it! So simple yet so rewarding … superb clarity !